For the first time in recent memory, both the API and EIA reports are showing very similar figures. Each statistic has outperformed expectations. Industry analysts were expecting lagging oil stocks due to a spike in demand stemming from Thanksgiving holiday travel. This did not materialize but may prove relevant for next week’s report. 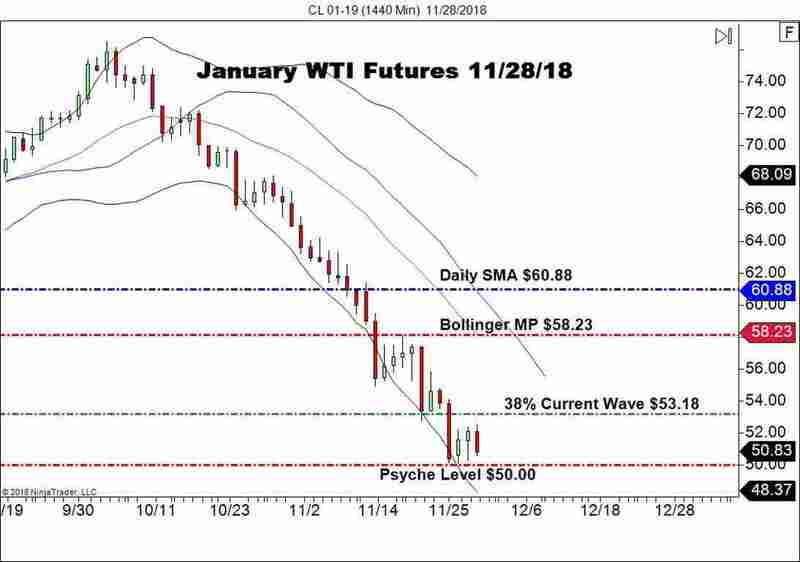 With oil supplies on the rise and a prevailing downtrend evident in January WTI crude, a test of $50.00 appears imminent. Bottom Line: The pronounced “L” formation on the daily chart above indicates market compression and a pending breakout. WTI is definitively bearish, thus a directional move is likely to develop under $50.00. However, initially, the $50.00 area is going to foster heavy two-way participation. Until elected, I will have buy orders queued up from $50.06. Using a tight initial stop at $49.93, this trade returns a fast 10 ticks on a sub-1:1 risk vs reward management plan.